We have to go all the way back to the first-century Jewish scholar named Hillel to find the source of this quote and it is as equally applicable now as it was then. 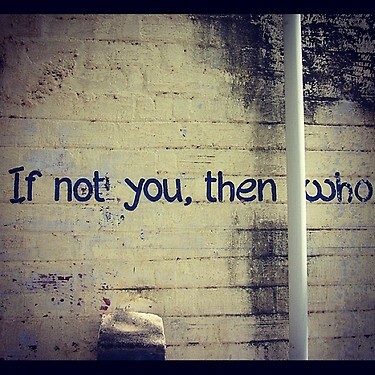 “If not you, then who?” It is time for us to truly step up and be the individuals God created us to be! Someone has to step up. If we don’t, then who will? I challenge you to let that someone be you. God has called you to be a great leader, willing to take charge and make progress now. I’ve often found that, even if you’re faced with a situation you aren’t all that familiar with, someone in your circle of influence knows the process and techniques, and is just waiting for you to get them going. ‘If not now, then when?’ I have 5 children – 5 incredibly beautiful children, but I can share story after story of things they have done that have triggered certain senses in my nose to flare! A little over a year ago we stepped into our Swagger Wagon and noticed it didn’t smell the greatest. We honestly didn’t think anything of it and left it. A couple of days went by and I eventually stepped into our van and it hit me like a brick wall – one of the worst odors I have ever smelled in my entire life! We were scheduled to take our van on a youth retreat – and there was no way any student in their right mind was going to want to ride with us! We cleaned out the entire van – top to bottom inside and out, and finally found it – a rotten bottle of milk that had spilled into the carpet of our van. It was not a pretty scene… We scrubbed, scrubbed, and scrubbed some more, but it took weeks of air fresheners and cleaning to get the smell of week old rotten milk out of our van! I love middle school students, but there is just something about the way a middle school boy smells that makes me cringe at the thoughts of it. On every packing list we create for our trips, I make sure to explain that Axe is not a replacement for a shower. Middle school boys should be required by the government to shower at least twice a day! Problems, like diapers or smelly middle school boys, do not smell better with age. They will not get any easier and they will not disappear. Waiting will not make it go away, and will not improve your situation. God has called us to step up now… He does not want us to wait. He is ready to empower us to be His hands, His feet, and His voice! Nehemiah didn’t wait! Daniel didn’t wait! Peter and John didn’t wait! Jesus isn’t waiting for you to do something miraculous to enter into a relationship with you. He has already provided each of us everything we need and has called us to live out our God-given purpose NOW! In order to live out our God-given calling and grasp ahold of the phrase, ‘If not me, then who,’ our lives must be filled with purpose and discipline! It is not about YOU! Our excitement in life must not be centered around who won the football game on Sunday afternoon. We cannot discover our purpose based on how many friends we have on Facebook, what other people think of us, or even our own abilities and talents. We must go back to creation in order to understand the purpose God has placed before us. According to Genesis 1, our identity involved a “spiritual address.” We were created in the image of God! We were not designed in the image of a monkey, an elephant, or a spec of dust from the middle of the atmosphere. We were created in the image of God, designed to live out our God-given purpose! Life is not about our wants, our desires, or our needs. It must be about what God wants, needs, and desires of us! In Colossians 1:16, Paul writes, “all things were created by Him and for Him.” We were created to bring Him honor and glory in everything we do and say. We were created to be His workmanship… His hands and feet… His voice of truth… His instrument used to reach the world. God has given us the command to go into the entire world, sharing the truth of Jesus Christ. Our complete purpose is found in an authentic relationship with Jesus Christ. He displayed the ultimate example of what it means to “carry your cross daily.” We must deny ourselves, carry our cross, and follow Jesus with our entire lives. Honestly, I have struggled with this truth concept my entire life. There is always something keeping me from a deeper relationship with Jesus Christ. Whether it was a high school relationship, college golf, working as a retail manager, doing ministry, or growing a family, I have consistently struggled giving up everything that I am and everything I have for the cause of Christ. What does that look like anyway? Do I have to sell everything I own and give it to the poor? Do I have to live homeless, since Jesus was pretty much homeless? Do I have to walk around smelling like I just left the garbage dump because I cannot waste money on a shower? Do my children not play Little League Baseball because I could use the money more wisely? Do I sell my iPhone and give the money to grow God’s Kingdom? How far do I go to deny myself for the cause of Christ? I could go on an on for days with questions just like these. Living out our God-given purpose begins with a choice of accepting Him as our personal Savior. We must realize we are nothing and He is everything. Without the Holy Spirit, there is not one ounce of righteousness within us. We not only need Christ in our lives, but we must desire Him above everything else. He must be the reason we live, the reason we walk, and the reason we talk! Our lives must be centered around who He is and what He can do. Our relationships must bring Him all honor and glory. There is nothing more exciting than to live a life of Christlikeness! Second, we must live a life of discipline! Why is it that we always lose the fire that is burning inside of us from missions’ trips, spiritual retreats, and even from accepting Christ as our personal Savior? Why do we go back to living life the same old way? Why do the wildfires built up inside of us gradually burn out? Why does it seem easy to be able to jump out of the gate with the passion and desire to change the world, but by the third or fourth lap we are ready to crawl back to our lazy boys? We have all seen sporting events where one team begins the game untouchable, yet by the end of the game they can barely make it up and down the field of play. We have all known of somebody who has missed the mark of what it means to finish well. They have lost the desire, the passion, and the discipline to keep up the good fight. Unfortunately, we are training a generation to believe it is fine to lose. I may offend some people, but I struggle with this. God does not want us to be mediocre at anything! He wants us to strive after greatness, being the best we can be at whatever we are involved in! He desires for us to not settle for second place, but to strive for victory. We must not settle for mediocrity. We must not settle for second best, or as my brother calls, the “first loser!” This must carry over into every area of our life, including our walk with Christ. I challenge you to look beyond who you currently are spiritually… Right now, envision what your life would be like if you clearly strived after the prize – the prize of victory – the prize of greatness – the prize of impacting lives on a daily basis for the cause of Christ – the prize of living your life to the fullest – the prize of being used by God in ways you cannot imagine. Picture the world around you. Picture your family and the difference the impact of a deeper relationship with Christ would make on their life. What about that broken relationship? What about that student that is struggling? What about the legacy you could leave? Why are we allowing the comfort of our own bubbles to get in the way of striving for the prize – the ultimate prize of victory in Christ? At the same time, a life with Christ can be extremely grueling. I am not going to say it is the easiest life you will ever live, because that is not true according to Scripture. God’s Word tells us that we will be persecuted, ridiculed, laughed at, mocked, and made fun for placing our faith and trust in Him. The majority of the disciples were mocked, laughed at, stoned, and even put to death for their faith. Stephen was stoned in a public setting for preaching the truth of the Gospel. Daniel was thrown into a lion’s den because he refused to stop praying to the Creator of the Universe. Shadrach, Meshach, and Abednego were thrown into a fiery furnace because they would not bow down to King Nebuchadnezzar’s image of gold. We must be committed to a strengthening relationship with Jesus Christ, no matter the circumstances, no matter what others may think, and no matter what others may do or say towards us! I didn’t even know what to say, how to respond, or what to think. As I evaluated my own life, I was scared to think of the legacy I was leaving. If something were to happen to me, what would my children remember me for? What would the students I minister to remember me most for? What would be said at my funeral? What would be encrypted on my tombstone? And most importantly, what would be the words of my Heavenly Father when I came face to face with Him? What about you? What legacy are you leaving? How will you finish? How will you finish today, tomorrow, this week, this month, this year, and this life – the one and only life God has blessed you with? Are you living out your God-given purpose, dedicated to a growing relationship with Christ? Are you focused on impacting those around you for the cause of Christ? Why do you do what you do?